Representative Alexandria Ocasio-Cortez met with just 17 of her constituents at a New York Library, explaining that her lack of accessibility and business hours came from her taking 'baby steps'. 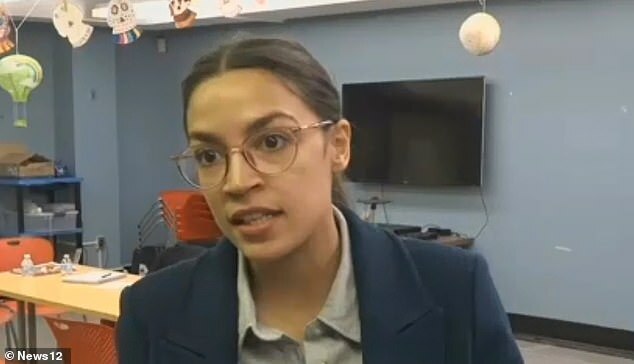 The 29-year-old politician stressed for her supporters to follow her on Twitter for updates after the brief meeting at Westchester Square Library in the Bronx on Thursday. 'Right now we're just taking these baby steps and adapting according to community feedback,' she explained to the New York Post. The freshman politician has a staggering 3.26million followers on Twitter. Four months after her inauguration and Ocasio-Cortez has only opened an office in Queens. She has yet to open one in the Bronx. But she stressed that her constituents could call, email or add her on social media. She is also having pop-up officer hours across the city. 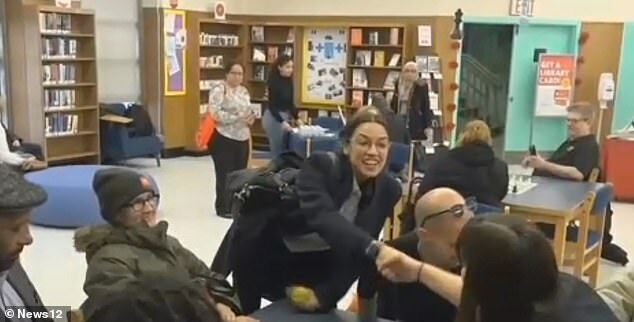 Ocasio-Cortez also stressed that she 'constantly' attends community events, adding that she was headed to the Bronx Community Board 9 on Thursday. But the politician did note that she wasn't 'allowed' to supply a schedule of her future events. 'Due to safety reasons I'm not allowed to, so Capitol Police, uh, yeah, it's intense, so, Capitol Police recommend that we don't give specific details about where we will be and when too far in advance,' she said. At the Bronx meeting, AOC stressed that people should call their local politicians to pressure them about rising housing cost. In a recent Time profile, it was revealed that AOC gets so many death threats that her aides are trained to evaluate her visitors.